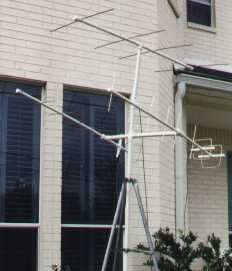 This was my first AO-10 antenna. As goofy as it looked, I managed a few contacts with 10 Watts, including Brazil on SSB. This is a pair of 8-element quagi's, set up for RHCP. Construction is simple, with no critical tuning elements. They are made from 1/2" PVC pipe and # 10 wire (stripped from Romex) for directors and # 12 wire for loops. The 4-element 2 m Yagi is made from 1/4" copper tubing and 3/4" PVC. It has a 50 Ohm dipole feed. The "quagi" antenna was designed by Wayne Overbeck, N6NB, amd is a high-gain antenna combining the high-impedance (and easy matching) characteristics of the quad antenna array and the high gain and ease-of-construction of the classic Yagi-Uda parasitic "beam" array. See the original article, N6NB's webpage, or the ARRL Antenna Book for complete description. This design is optimized for 436.8 mHz with a 50 Ohm feed. It is a slight departure from the design shown in the reference above. The graphic on the right depicts the pattern in free space. The antenna is built using 1/2" PVC pipe (or 3/4" if prefered) and several fittings. The driven element and the reflector are formed out of 12 gauge wire (striped from house wiring, but insulation left on) and the directors are made from 10 gauge wire. The following table is used for cutting the wire: while the driven element can be trimmed to tune the antenna, the directors should be cut accurately within 1/16" or performance will suffer. If 3/16" aluminum rod is used for the directors, another 1/2 dB of gain is predicted--but hardly worth the effort. Using stainless steel bolts, nuts, and washers, directly connect the 50 Ohm coax feed to the driven element. I use crimp-on ring lugs to make a neat connection. Waterproof the connection with plenty of electrical tape or Coax-Seal and paint all the PVC parts to prevent UV deteriation. A single one of these quagi's will give excelent service for all the LEO's. The free-space gain is calculated at an impressive 13.15 dBi with a 10.2 dB F/B ratio. That is a lot of performance in an antenna you can hold in one hand! A pair of these will provide circular polarization (see the picture above) and up to 3 dB more gain, depending on orientation. One also makes a fine portable antenna for AO-27, easily bringing in that bird full-quieting at the horizon. As the azimuth plot above shows, the gain is high and the pattern is narrow (equivalent Yagi model in YagiMax 3.46). The half-power beamwidth appears to be about 42 degrees.